Paleo Baby Food: Is it a Scam? Some dietitians are calling the new Paleo baby food pouches a scam. What do you think? 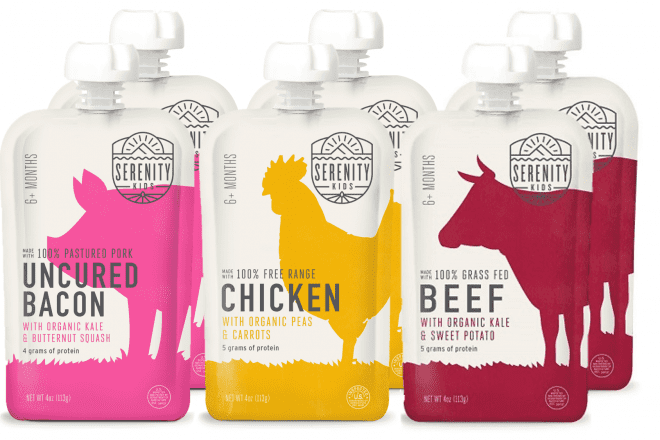 I have seen a lot of criticism from RDs about the new Serenity Kids Paleo baby food pouches. I guess I’m in the minority but I honestly don’t see a problem with the product, besides the insanely high price of $4.50 per pouch! First things first. Most babies do NOT need to eat Paleo to be healthy. (I don’t say “all” babies because some may have allergies or other reasons to exclude certain food groups from their diet.) But foods that are Paleo can certainly fit in a baby’s healthy diet. The Paleo diet includes meat, fish, eggs, nuts and seeds, fruits, and vegetables. It excludes dairy, grains, legumes (like peanuts, beans, and lentils), sugar, and alcohol. What’s in Paleo baby food pouches? Serenity Kids has 3 varieties of Paleo baby food pouches. They contain meat and vegetables, and one variety adds avocado oil. While they are labeled as ‘Paleo,’ they are not that different from other baby food products on the market. They are not that different from what I would tell you to feed your baby from home! What is different is the marketing and the quality of the meat. Serenity Kids specifically markets their product as Paleo. But many other baby food products could be called Paleo as well. Fruits and vegetables are a big part of the Paleo diet, and that’s what a majority of baby food consists of. The biggest way Serenity Kids distinguishes their product from the others out there is by using high quality grass-fed and pasture-raised proteins. The price of the pouch makes sure you know it’s high quality! You’re not going to buy almost $5 pouches by mistake. And if you do, it’s probably a mistake you won’t be repeating. That ain’t cheap!! Serenity Kids pouches have a nutritional profile very similar to other baby food pouches. Some people assume that Paleo means low carbohydrate, but you can see that the Serenity Kids Chicken pouch has 9 grams of carbohydrates, just 1 gram less than the Sprout Organic pouch. The other two Serenity Kids flavors both have 10 grams of carbohydrates. I do not recommend exclusively feeding babies pre-packaged food. They should also be trying fresh cooked foods at home. When pouches are a small part of the baby’s diet, you should not stress about what’s in them. Even if you prefer to eat organic & grass-fed at home, I still wouldn’t stress about buying overpriced Paleo baby food pouches. The more important thing to focus on is exposing your baby to a variety of foods at home, and when you need pouches for convenience, just grab whatever is on sale! Is Collagen Safe for Toddlers?